The great race by U.S. cloud companies to capture part of the huge Chinese market continued with Friday’s news that IBM is working with Tencent Cloud to provide cloud infrastructure and software-as-a-service capabilities for business in China. IBM SoftLayer opened a data center in Hong Kong in June. This news revolves around IBM using Tencent cloud to provide business services; it does not at least yet involve IBM’s SoftLayer cloud arm, a spokesman said. Some companies are running China operations out of Hong Kong or Singapore, but as Catchpoint Systems’ CEO Mehdi Daoudi pointed out recently, latency and other issues mean that if you’re serious about doing cloud in mainland China, you need presence in mainland China. In January, IBM said it would devote $1.2 billion to cloud infrastructure. While that’s a good chunk of change, it probably wouldn’t cover the expenses of building even one of the data center farms deployed by companies like Google, AWS and [company]Microsoft[/company]. [company]Google[/company], for example, spent $2.4 billion on infrastructure in its third quarter alone. 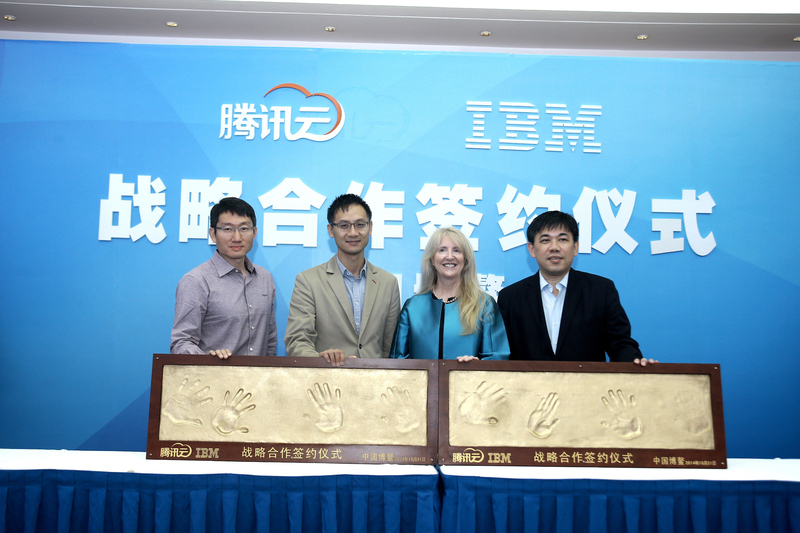 Tencent Cloud and IBM signed a memorandum of understanding to collaborate on cloud deployments in China. Image courtesy of Tencent. Note: This story was updated at 10:39 a.m. to reflect that this Tencent deal does not involve IBM’s SoftLayer cloud unit. When cloud computing is now a mainstream product, does Tencent need IBM to build cloud ? My answer is NO since I saw the presentation on Openstack Summit in HK last year. This is a good move by IBM. The Chinese business, cultural, and regulatory environment is very different than that of the west – IBM will benefit greatly from having a mainland partner. On the flip side, the mainland public cloud story is very weak at this time and they will benefit from IBM’s resources (Softlayer) in this area.